in outstanding locations. The company’s enviable reputation is built upon this. Today, with over 40 years honing its craft, the Runnymede brand is widely recognised as a hallmark of the highest standard in creating truly outstanding new homes. The Runnymede brand of new homes encompasses elegantly designed apartments and houses in attractive gated courtyard settings through to individually designed family houses and imposing mansions. The scale of a home is perhaps the only variable, what doesn’t alter are the hallmarks of quality. The same care and attention in design and selection of materials for the larger home is applied to homes of a smaller scale. A Runnymede home can only be found in some of the finest locations of Surrey and neighbouring counties. 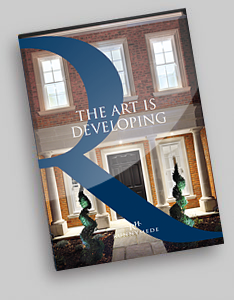 Download the coffee table book ‘The Art Is Developing’ to view stunning interior and exterior images from some of the recent homes we have created. Runnymede applies the same care and attention to looking after our clients as we do into designing and building our homes. Our Client Charter outlines our commitment to you as a buyer of one of our properties. From the moment you reserve your new Runnymede Home, we aim to make the experience enjoyable and informative each step of the way. Our goal is to take care of you, not just when you are buying but also after you have moved into your new home. All of our staff are trained and motivated to provide a high level of customer service to our clients. In many cases we are able to assist our purchasers in making individual specification choices for their property. Whilst this does depend on the stage of construction, we will make every effort to accommodate our client’s requests. From reservation of your home, you will have personal contact with the building team and on the day of completion you will receive a comprehensive home manual and we will carry out a detailed introduction to the workings of the appliances and mechanical systems. Our in-house maintenance team will also attend to any snagging issues six months after completion.